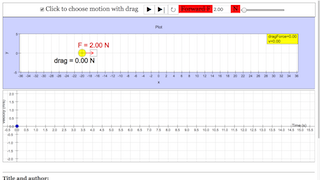 This SIM illustrates how drag force namely air resistance changes with the velocity of the object. This in turn shows how the resultant force varies which affects the rate of increase of velocity. The SIM hopes to visualise graphically how the forces vary as velocity increases and approaches terminal velocity. · Students are unable to explain why objects eventually reach terminal velocity. · Students understand how velocity affects air resistance.